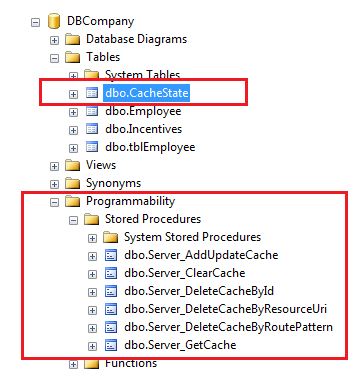 In the previous post Apply Caching in Web API Using CacheCow, I have shared about apply caching in-memory using CacheCow and its benefits. In the continuation of that post I’ll sharethoughts about persistence caching and its implementation. Caching always plays vital role when we have very frequent request model to server to fetch the data. Caching helps to reduce frequent hits to server and brings potential information in a minimal duration. Caching also helps to enhance Web API performance and reduce the load on server where Web API is hosted? EntityTag is an HttpHeader used for cache conditional request for resource.EntityTag is also pronounced as ETag. 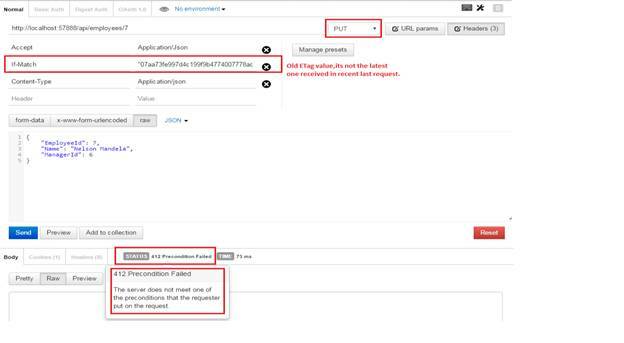 Let’s take a simple example which uses ETag like “Client sends a request to Http server with Etag value that holds an updated value for cached resource, server identifies this with ETag value whether client has an already updated value for resource or it should revert with a latest copy back to client. 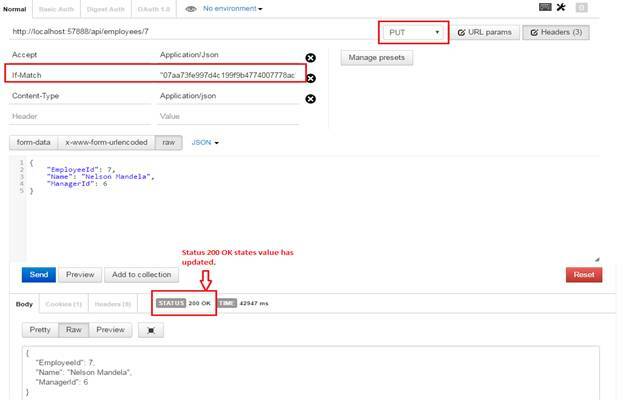 Initially client sends a request http://localhost:57888/api2/employees/getdetails/5 to server and ask for employeeId 5, as per initial request it won’t be cached and server will return the fresh copy of the requested resource with some ETag value. We’ll see this in illustration down the level of this article. Later client send the same request to server with header If-None-Matchalong with ETag value which client has received in body response of earlier (e.g. TR6truy7) request If server finds equal ETag value for the requested resource than server responds Http not modified otherwise server will respond with new ETag value. Header “If-None-Match” works only with HttpGet and HttpDelete. HttpGet and HttpDelete works in similar manner. ThoughHttpPut works slightly in different nature. 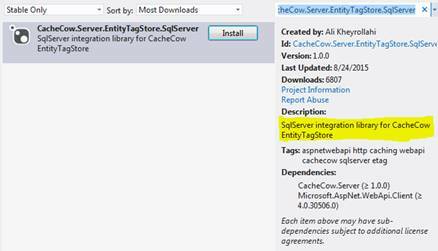 For this purpose we’ve to install “CacheCow.Server.EntityTagStore.SqlServer” from NuGet manager. 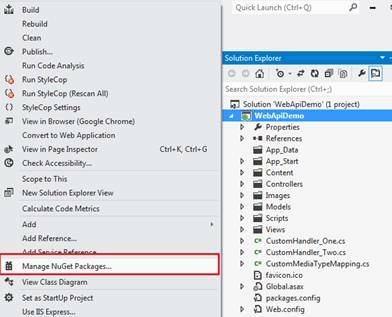 Right click on solution and choose manage NuGet Manager. Type CacheCow.Server.EntityTagStore.SqlServer in search, the following window will appears shown below. Click on install button. 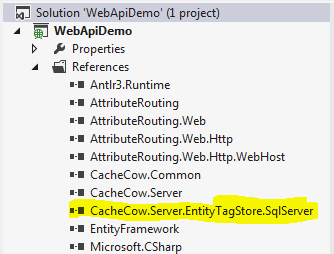 Once the installation has done, we need to register CacheCowSQlServerEntitytagStore handler in WebApiConfig.cs file like shown below in depicted image. Each procedure works in different manner. Now I’ll perform PUT HTTP PUT request to understand how persistence caching works does. We will see this complete step by step process to understand this here. I’m using fiddler for this purpose. As soon as you receive a response for the latest request sent by client, there will be an entry relevant to resource in CacheState table exist in database as shown below in screen shot, and which is self-explanatory. We will utilize this recently received ETag value for further communication in order to update the record using HTTP PUT verb. Kindly send If-Match parameterin header of request to update the resource. Kindly refer the image shown below: If- Match has the value "07aa73fe997d4c199f9b4774007778ac" which is sent by the server in last request. The status 200 means resource has updated . If I use the latest Etag value than it works fine and update the value.